Did you know all you need for the perfect cat eye makeup is a guitar pick? Remember when smoky, smudgy eyeliner was the way to do your eyes? How much simpler was life then? Now, every girl is expected to have mastered liquid liner and that dreaded, hyper-precise cat eye flick that seems easy enough on paper but is darn near impossible to actually achieve in real life. I'm sorry, but most of us are not makeup artists. If you saw my handwriting, you'd much less trust me to write out your next Target shopping list, let alone try to draw anything on your face (especially if you're using waterproof makeup because Lord knows, that's never coming off). Cat eyes don't have to be mega-difficult. The beloved company Beauty Blender (creators of most MUA's go-to foundation applicator) have come up with a foolproof way to make the perfect, sharp cat eye without so much as a drop of fallout (for those of you who have tried cat eyes with eyeshadow, you know the struggle). The only problem is, Beauty Blenders' Liner Designer is $16—a total waste for a tiny piece of plastic. 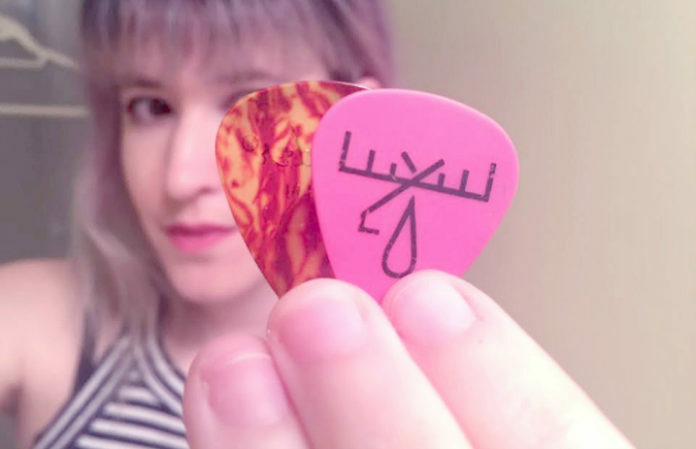 For $16, you could buy a new concert tee, go see an indie band's show, order like three Domino's pies—pretty much anything but buy a tiny little piece of plastic. Fortunately, all you need to get the same effect is your favorite guitar pick. Here's how! A liquid liner or shadow. Here I used Jeffree Star's liquid lipstick in I'm Royalty. It's eye-safe and matches my hair so I can't really argue. It's pretty much the same thing as a liquid liner, but you can also use it on your lips! If you're using a liquid lipstick, make sure it has a matte finish (less likely to smudge) and is eye-safe. Some of my favorites (like the oh-so glittery Lime Crime Diamond Crushers) sadly are not. You'll also need a tiny concealer brush if your liner doesn't come with its own applicator. Since Star's product is made for lips, the applicator is just a bit thick for a thin line, so I picked up a cheap brush from e.l.f. cosmetics. Last but not least, you need a guitar pick! These cost about 75 cents, or you can find one for free on the floor of your favorite venue (probably how I found this one, if I'm being honest). Make sure it's clean though; you may not mind the germs while you're at a sweaty concert, but your eyes certainly will. Don't put too much on your brush. It's buildable and much easier to work with a smaller amount. Align your guitar pick with one point touching the end of your lower lash lid, slanted towards the outer portion of your eyebrow. Carefully paint the outer line of the cat eye. This line can be super thin; you're going to use the pick to make it wider as well. If you're line is too thin for your liking, use your pick to create a guide on your upper eyelid like in the picture above. Fill this in the same way, but be careful not to go over the bottom line or it will look smudgy and not precise. Finish out the look by adding liner to the rest of your lid. Start slowly from where the cat eye begins to the inner corner. I opted to not put eyeshadow on my top lid because I had drawn such a dramatic line. Instead, I lined my bottom lid with Moonwalk by ColourPop—it's a super bright, glitter greenish gold. To get the most dramatic look out of your cat eye, add some lengthening mascara, particularly to your bottom lids if you want a vintage-chic look. Have you tried this out? Tell us in the comments!